Almonds are truly a super food. High in vitamins, minerals, protein, antioxidants, and mono-unsaturated fatty acids. This queen of nuts protects our tissues and increases the ability of each cell to function optimally. According to Ayurveda, they are one of the most sattvic foods. Increasing our level of sattva assists all of our cells to flourish and rejuvenate. A food is categorized as being sattvic when it enables us to strengthen our inner wisdom, purity, harmony, and balance. Have you ever made your own almond milk? The taste and nutritional benefits far exceed the commercial boxed variety. The average processed almond milk contains 1 gram of protein per cup, while your homemade almond milk has approximately 6 grams of protein. The amount of calories in this recipe will depend on the amount of water and honey. You may first want to try this recipe exactly as it is written, and then experiment by changing the ratio of nuts to water. This recipe went through a number of versions. 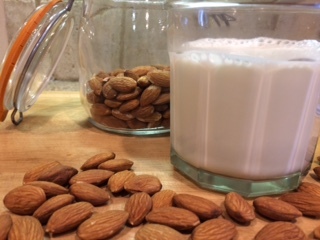 Other almond milk recipes use the soaked nut with their skins and then strain the pulp through a sieve or nut bag (creating a massive amount of wasted nutrition). A high powered blender such as a Vitamix will literally liquify the peeled nut. If you do decide to strain the milk, there is hardly any remaining residue. To strain or not to strain, that is the question. Depends on your personal preference. Pouring boiling water over the almonds will blanch them to ease the peeling process. Pinch the nut between your thumb and index fingers – the peel will just slip off. Put the peeled almonds in the blender container along with 2 cups of water (yes, begin with 1/2 of the water), the vanilla, salt, and honey. Blend on the highest speed until the nuts are completely processed. If using a Vitamix, blend until you feel the outside of the container is becoming warm to the touch. Then, decrease to a very low speed and slowly add the remaining 2 cups of water. Taste your almond milk to determine if you need to add any additional honey or if you would prefer to put it through a strainer. If it is grainy, you may just need to blend for a longer time. Store in the refrigerator in a glass bottle. Stays fresh for approximately 4 days. You may desire to use a different sweetener such as Turbinado Sugar or Maple Syrup. Honey is listed in the recipe as it is also a sattvic foods. Adding 1 tsp of Rose Water is divine. Adding 1/4 tsp of cardamom is delicious plus Vata pacifying.